All is Merry and Bright…especially in the dining room! We are putting some finishing touches in the room and then we will be ready to entertain guests! 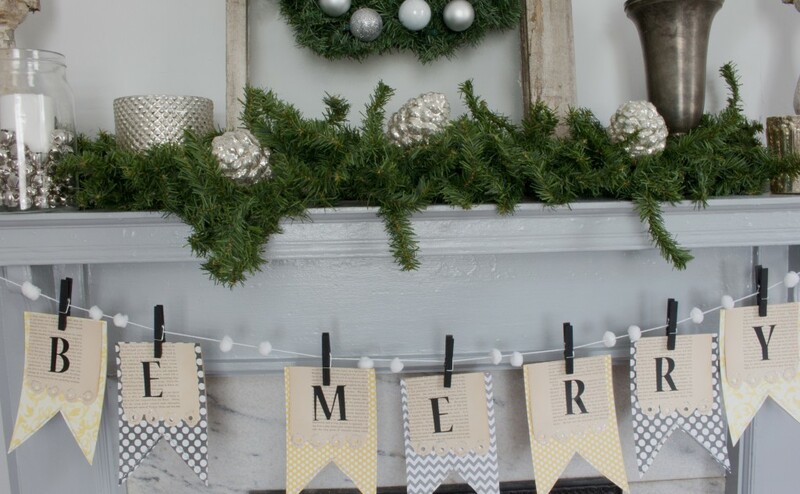 What do you do when you decide to decorate your Christmas mantel with non- traditional colors – and the colors that you want to use don’t exist? Well..we decided to make a banner for the mantel that would match the decor perfectly! To create our DIY Christmas banner we started with a color theme. 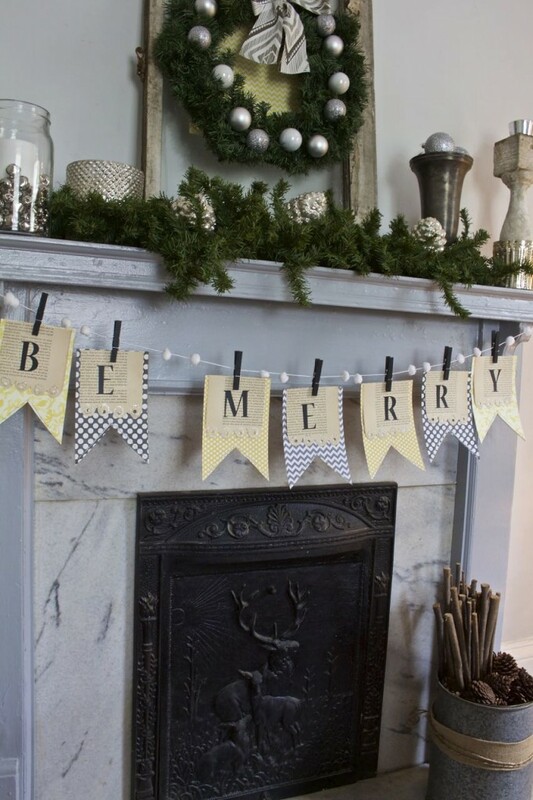 This banner is for the dining room fireplace mantel and the room colors are gray and pale yellow. Secondly we chose the phrase “Be Merry”. This sets the mood for our party and dinner guests. Scrapbook Paper in color theme choice. Ours were purchased at Hobby Lobby for 50% off. Vintage Book Pages – our book was .25 cents at a yard sale and was falling apart – perfect for crafting! Trace the cardboard pennant shape on the scrapbook paper and cut. Mod Podge the scrapbook pieces to the cardboard. Let dry. 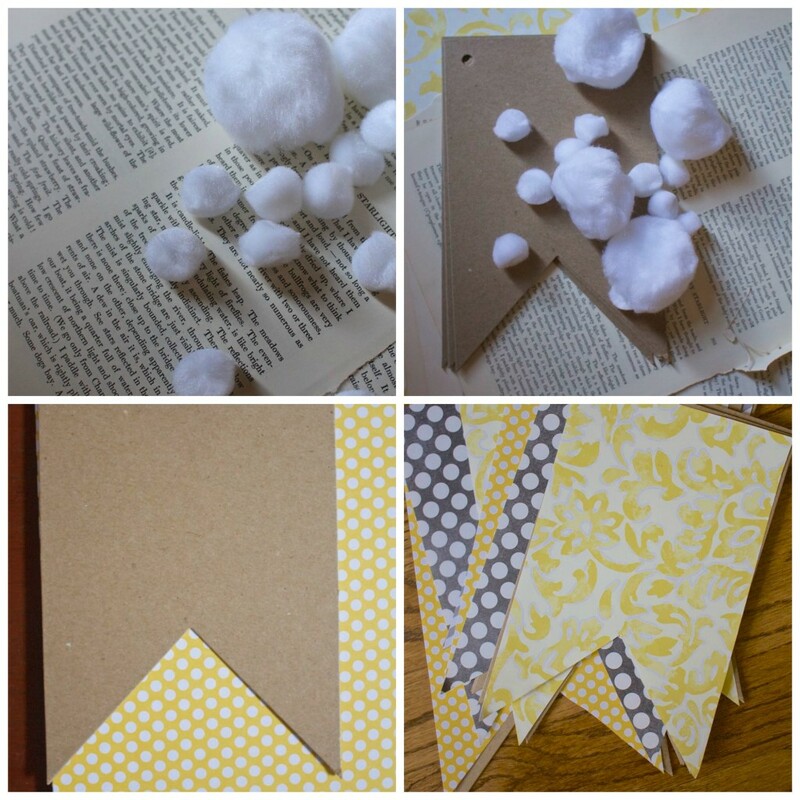 Cut vintage book pages in the size and shape you prefer. We also added a bit of glitter for some shimmer. Measure out the yarn to fit your mantel. Lightly roll the cotton balls for a more rounded shape. Thread the cotton balls onto the yarn – knotting off the yarn ends when complete. We used black clothes pins we got for $1 at Target to hang the letters on the banner. We love how the entire craft turned out! 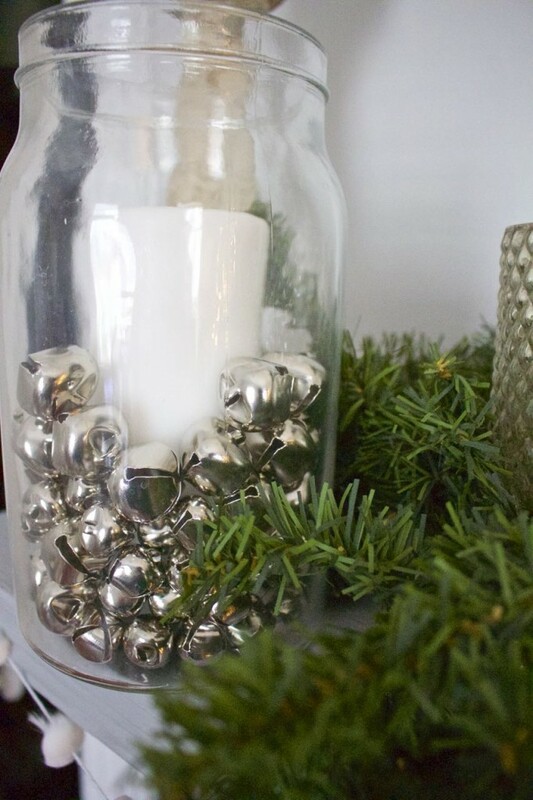 Such an easy idea to add jingle bells and a candle to this glass jar, which instantly made it a festive candle holder. The different mixes of silvers really goes along well with the banner. 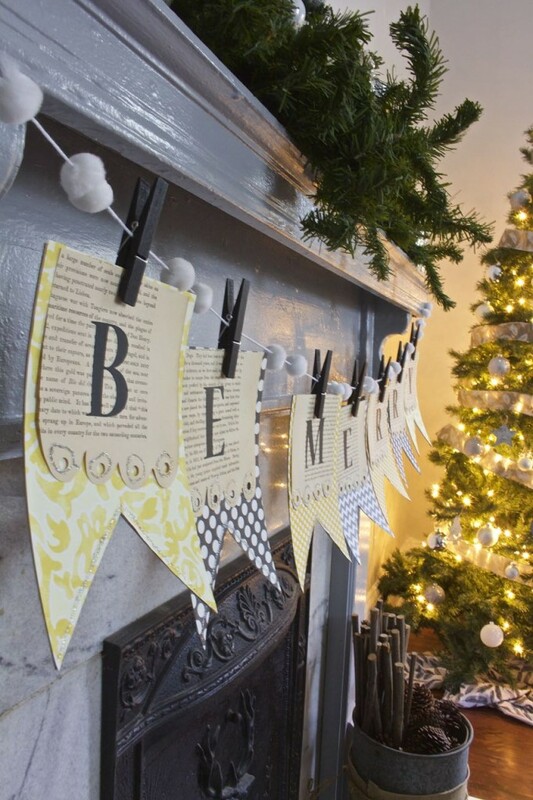 We hope we’ve inspired you to create your own DIY Christmas Banner – Be Merry (one of our favorite holiday sayings). Not only was it easy to do, it was also a very inexpensive craft to make. We were able to use non-traditional colors, but still make the mantel festival and fun! Be sure to click on the links below for more great inspiration! 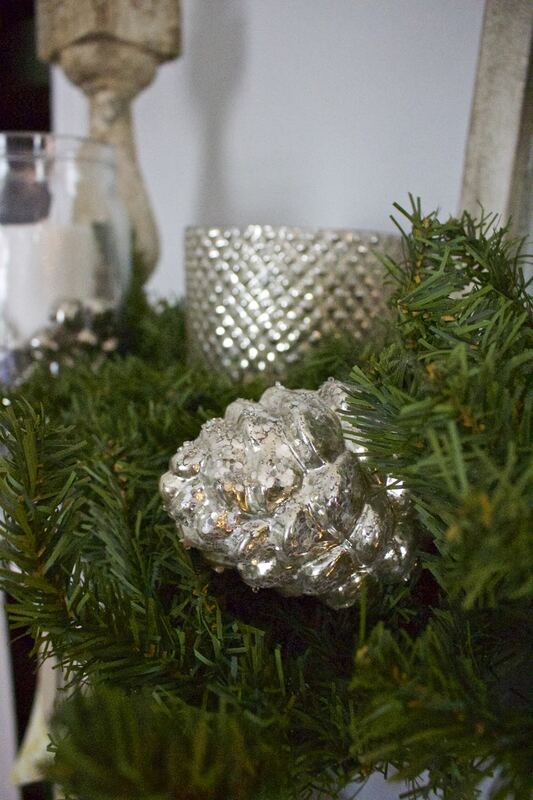 You’ll see everything from gorgeous decor to yummy holiday recipes… and everything in between! Here’s a look at what’s already been shared this week, along with what’s coming up! Thank you CoCo – It is looking pretty festive in the dining room 🙂 We seriously heart mercury glass too! Your entire mantel is stunning and the banner was the perfect finishing touch!!! I love it! It has been fun touring with you this week! Merry Christmas! Lindsay – you’re just too sweet! This was a fun and easy project! We’ve enjoyed the week too! Cheers to a happy week and Merry Christmas! So pretty! 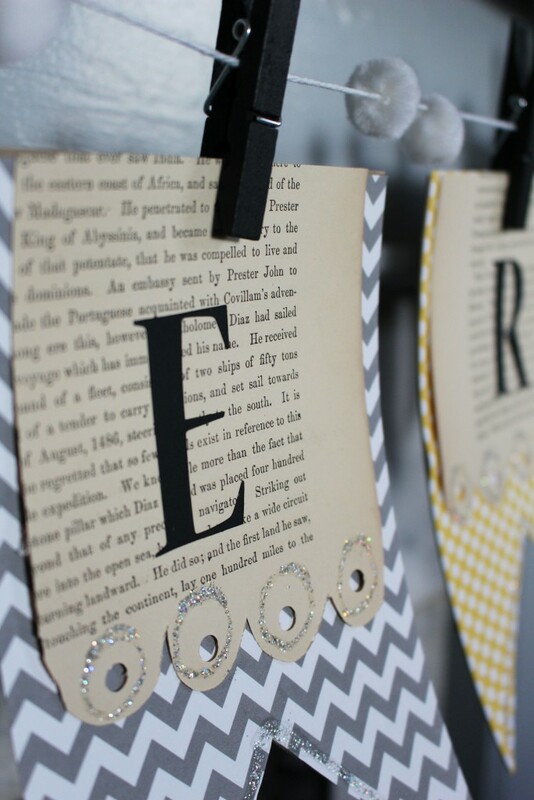 I really love crafts using book pages. Your entire mantel is gorgeous. Hey Amy – we miss you! You are always so sweet and kind…thank you! You’re too sweet Liz…thank you sweet friend! Beautiful! Perfect project for the kids to do too, love that! Hi Lisa – yes it would be! Thanks so much for stopping by! Your holiday mantle is beautiful! And I love how you used non-traditional colors in your banner! Thank you for sharing your creativity on the HFTH blog tour! Sondra – we can’t thank you enough for your invitation to your fabulous tour! We appreciate you so much…thank you! Hi Linda! 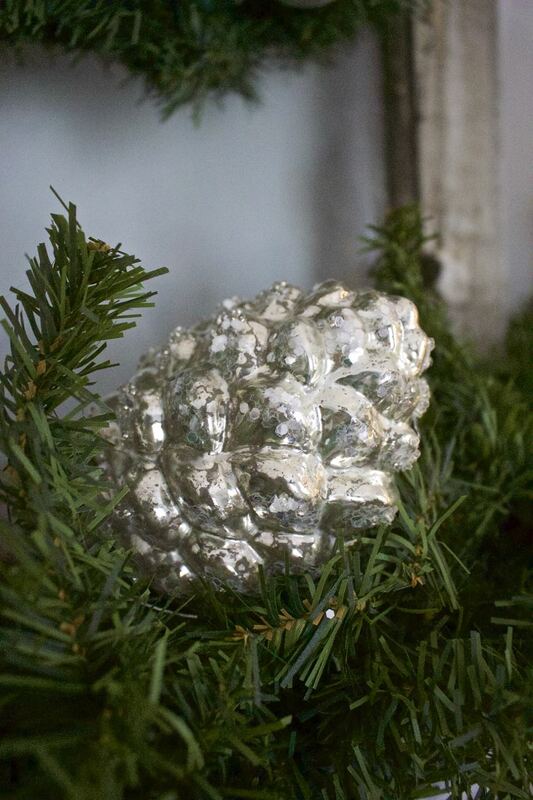 We really love mercury glass too. Thanks so much for stopping by! So many great ideas! 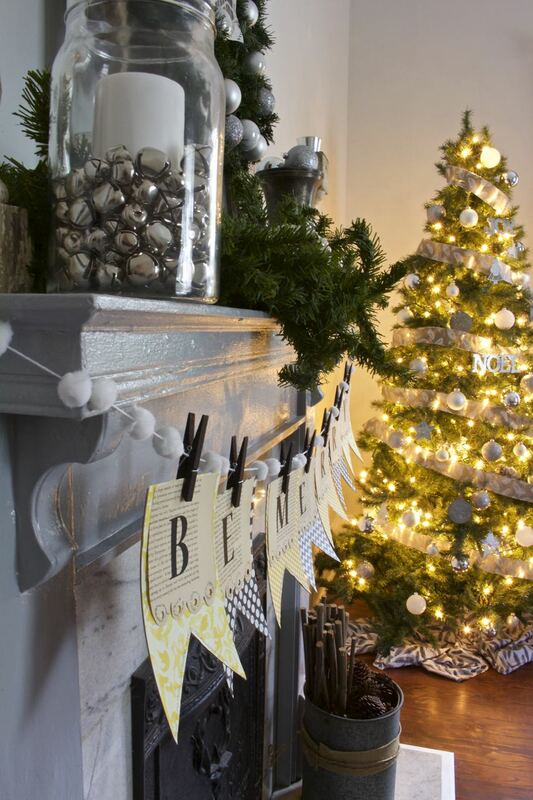 I love how you used cotton balls on your garland (so ingenious) and adore the collection of silver bells in the glass jar. I went with non-traditional holiday colors this year as well and just love the fun twist. Happy holidays you two! I love banners and especially yours with the print paper. Your whole mantel is just gorgeous. Thank you for sharing all the details. Hi Sarah – You are too kind 🙂 We love to use what we have on hand and try to create from there. Thank goodness it worked LOL. We are firm believers in using the colors that make us happy and we loved your beautiful tablescape! Thanks so much and happy holidays! Hey Leanne – You’re so sweet! Thanks so very much – we truly appreciate it! Love it ladies! Love the cotton balls on the garland and the jingle bells in the jar! Hi Maryann – Those are our favorite elements too! Thanks so very much…it’s been a fun week! This definitely sets a festive tone in your dining room. Such a lovely touch to your mantle. I am a sucker for a book page banner, especially with glitter! So pretty! Hey Meredith – We love book pages and glitter too. It’s kind of like mixing old and new. Thanks so much for stopping by! Jenn and vicki- i love how you layered your banner. I looks amazing on the mantel and i am sure equally as beautiful in your room. Happy Holidays! Hi Laura – Thank you so much. We really are happy with our end result…it does look pretty good in the dining room! Merry Christmas! 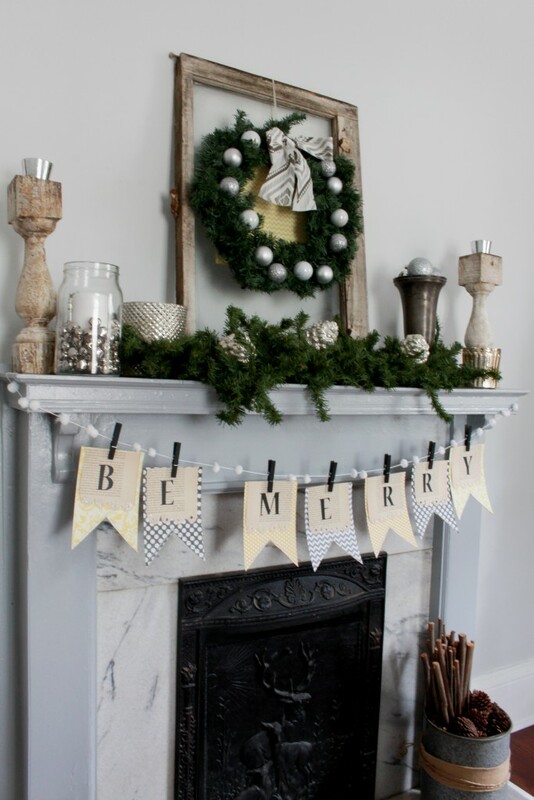 I’m in love with your Be Merry banner and your whole mantel! Pinning and sharing! Jane – you are the best! We can’t thank you enough…Merry Christmas! 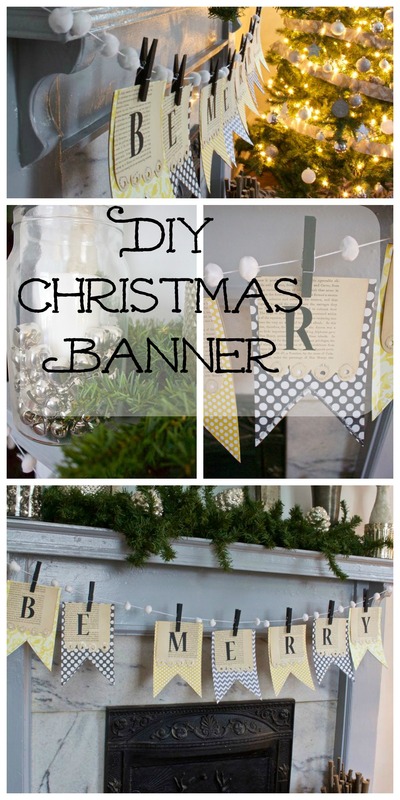 I adore your banner and it looks like an easy project that could be used for any occasion. The book pages are a nice touch. Thanks for sharing at our Inspired by You party!